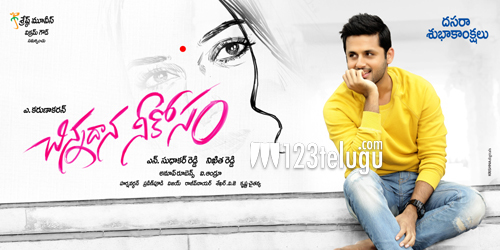 Tollywood young hero Nithin, who is riding high with back to back hits is busy shooting for his upcoming film ‘Chinnadana Neekosam’. Recently, the film unit has completed a long schedule in Barcelona and now some key scenes are being shot in Hyderabad. With this almost 90 percent of the talkie part will be finished. The producers have released the first look on and it has received good response. Directed by Karunakar, this romantic entertainer features Mishti Chakraborthy of the Hindi film ‘Kaanchi’. Anoop Rubens is scoring music for this film which is produced under Nithin’s home production ‘Shresta’ banner.